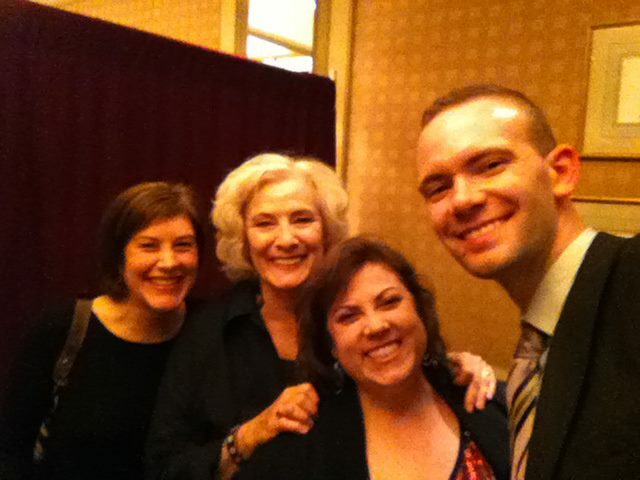 Betty Buckley is taking on the men of Broadway. That is, she's singing the songs performed by men and showing 'em how it's done in her new cabaret "Ah Men! The Boys of Broadway" at Feinstein's at the Regency through October 29, 2011. Joining Betty on stage are Christian Jacob at the piano, Anthony Pinciotti on Drums and Peter Barshay on bass. Betty can sing any style, but I have say that's it's extra fun when it's swinging, jazzy night. With this trio, the room was hopping. To me, it's a perfect throw back to the great girl singers and Betty is great at continuing this legacy. Betty collaborated with musical director Eric Stern to create the evening. In addition to accompanying Betty, Christian Jacob also lent his talent to arranging several of the songs, including "Come Back to Me" and "Hey There," two of the most sultry renditions of the evening. She peppers the evening by sharing her own stories of some of these shows that she's been in or has always loved. Betty has a wonderfully dry delivery so she kept us stitches, especially when she sang the tongue in cheek tune written especially for her and this gig by Eric Stern and Eric Kornfeld, called "A Hymn to Her." It's almost a lament of the lack of strong roles for women, but it's too funny to be bitchy or even maudlin about the sad truth. Betty opened with "I Can See It" from The Fantasticks - I remember her saying in a previous show a few years ago that she always wanted to play "El Gallo" - it was fun to see her finally get this chance to at least sing one of his song. Her voice was so good and strong on this opening number that it was clear that we were in for a fabulous evening. It's not all songs of Broadway - she throws in a few songs that were in the movie musicals that shaped her as a performer as well. Betty prefaces the show with professing her love for men and an teen obsession that began with West Side Story and her desire to be a "Jet." In a hysterical rendition, she recreated the "Jet Song," complete with New York accents. 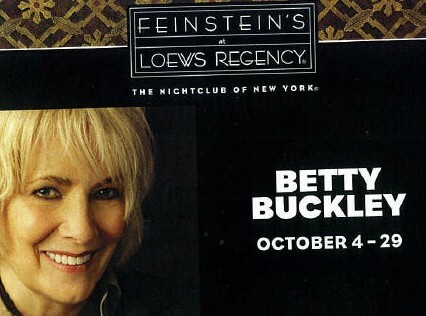 In 2003, Betty was in Elegies, the William Finn song cycle that was produced at Lincoln Center Theatre. In Elegies, Betty sang the heart stopping song "Infinite Joy," but in this show she sang "Venice." If she had sung nothing else at all for the whole night, this would have been enough. However, the absolute highlight of the evening for me was the suite of songs she sang from Sweeney Todd: "Not While I'm Around/Johanna/My Friends." Betty is known for her song interpretation and even teaches classes on the subject. I almost felt as if I was at a one woman production of Sweeney Todd, between her acting and the lighting. My heart was pounding after her "My Friends." I could not help think that if anybody ever decided to revise Sweeney again, Betty would be perfect as the razor yielding barber. Almost every time I hear Betty in concert, I'm introduced to some new song. While I always want to have her rendition in my collection, I usually settle for the original version. I'm always grateful to Betty for the eduction she gives in Broadway or even song history and while I haven't been able to attend one of her song interpretation classes (yes, you can audit them even if you're not a singer), I like to think that everytime she's performs, I'm getting a lesson in history and even more, in how to open my heart and mind. She gives the music as a gift - thrilling me one moment and tugging at my heart the next. I attended the show on Friday night with Karigee and ThtrBob, aka the Chicago Theatre Addict - the three of us together saw Betty at Feinstein's in 2008, one of the best nights in this girl's life. Karigee and I have continued to make a point of not missing Betty when she's in New York City. I'll be back again with Karigee and two girls who have never seen Betty perform live - they are definitely in for a treat. You can also treat yourself to this show by calling 212-339-4095 or buying online via Ticketweb. Betty's there on Tuesday nights through Saturday nights, with two shows on Friday and Saturday nights through October 29th.